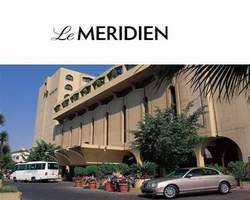 Le Meridien Heliopolis is located in a residential district near the presidential palace and the International Congress Centre. Excellent cuisine is served in its restaurants, and the hotel has a Club President floor for guests seeking maximum privacy. Special Discount for group reservation, for group reservation click on below Button. Rates are not applicable during special events, holidays, and conference. Extra beds are available on request. Above rates are subject to change without prior notice. Above rates are special corporate rates offered by Cresset Travel. Hotels Normal rates are 50% higher. Cancellation, No Show, Child Policy, Extra bed, Meal Rates, Check in & Check out time and other benefits as well as Terms & Conditions of Bookings will be advice by our Reservation Agents. Some of the hotels provide free airport shuttle service, however if you prefer to have a PRIVATE CAR TRANSFERS You Can Send Us mail at reservations@cresset-travel.com. We would like to invite you to join our tours & excursions while visiting our country. 283 lavish and elegant guest rooms and suites are accented in luxurious shades of blue and rich burgundies. Experience the mythical splendour of this charming city in exquisite comfort at Le Méridien Heliopolis. Step into a world of storied elegance – enticing to the eye and the palate – at Le Méridien Heliopolis. Experience gastronomy from around the world and around this fabled city – the bold flavours of Egyptian cuisine come to life for you in this land of many facets. The ever-refined and elegant Marco Polo restaurant is the hotel’s most famous venue. Savour delicacies from all over the world amidst an exquisitely sophisticated atmosphere. Open from 1pm to 1am daily. Experience the subtle flavours of Thai cuisine, lovingly prepared by exceptionally skilled Thai chefs who present to you the pride of their homeland. Open 1pm to 11pm. This lively and stylish French Brasserie is open day or night to indulge a sudden midnight craving. Buffets and a traditional menu are available. Enjoy succulent grilled meats and other delicious specialties by the magnificent turquoise waters of the pool. Lounge in the cool evening breeze and smoke a traditional shisha as the sun sets over the gardens beyond. Open in the summer months, 7pm-midnight. After a drink at the 51, try Jasmin for a snack later in the evening and enjoy your favorite drink to the rhythm of live music. Dance the night away to sultry international beats into the wee hours of the morning. Enjoy a cocktail in the middle of the night or have a nibble at an array of delectable snacks. Le Méridien Heliopolis offers a number of banqueting and conference rooms for social or corporate events. Each sun-filled meeting room features High Speed Internet Access, video conferencing facilities, and state-of-the-art audiovisual equipment. Host a conference or seminar amidst the modern Egyptian style of the Set, Hatesheput, or Amenophis rooms. Your wedding day is the most romantic day of your life. Celebrate your pledge of eternal love at the refined and intimate Aramis ballroom. Accented with elegant touches and a sleek contemporary feel, the ballroom is an idyllic place for a wedding ceremony or a triumphant reception, for a couple’s first kiss or first dance. The catering team at Le Méridien Heliopolis has a long-standing reputation for exceptional arrangements and a history of creating exquisite events. Whether you wish to host an intimate dinner of 25 or a sumptuous reception for 500, the banqueting and catering staff can make your vision a glorious reality. Luxuriate in the peace and soothing tranquility of the leisure centre at Le Méridien Heliopolis. Work up a sweat at the sophisticated fitness facility; indulge yourself at the beauty parlor. Retreat to the third floor of the hotel for a quiet swim in the stillness of morning or head to the solarium in the evening to relax after a tiring day. The sun setting over the gardens and the city beyond is an enchanting sight. Consult the Concierge desk for a multitude of luxury services – arrive at the Pyramids or other sites in style in an elegant limousine, receive a lively welcome at the splendid bazaars and advanced bookings at the city’s finest restaurants. The Concierge can also make arrangements with travel firms around the city – firms send buses to pick up hotel guests for a number of exciting sight-seeing opportunities. Meet & Assist services, as well as Transfer services are complimentary, however Le Meridien Hotel kindly request that you advise the hotel 48 hours in advance of arrival.